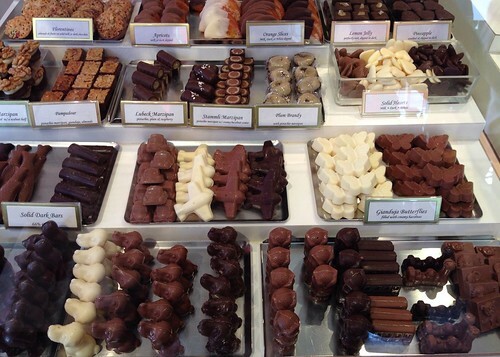 A few months ago, I noticed a deal on Amazon Local for a chocolate walking tour of Beverly Hills. As you know by now, I love sweets, especially chocolate, so this was right up my alley! Plus, I hadn’t tried half of the shops on the list, so this was the perfect excuse to finally check them out. So, along with my sister Bethany and friend Randi, we set out to taste some of the best chocolate in Beverly Hills, on foot! The tour was organized by Great Food Tours and led by Jason, who was very knowledgeable about not only each shop we visited, but LA and Beverly Hills as well. He shared interesting facts and details about local landmarks, and even those of us who have lived here for decades still learned something new. If you’re looking for something different to do with local friends or out of towners, this is a super fun way to spend two hours walking around Beverly Hills while experiencing great food! The day of our tour the weather was absolutely perfect–68 degrees and a sunny sky. 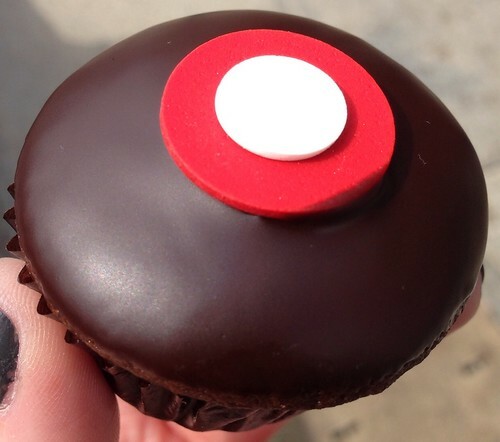 We started out at Sprinkles Cupcakes where we were treated to a mini Chocolate Marshmallow Cupcake–dark chocolate cake filled with marshmallow cream and bittersweet chocolate ganache. Rich, moist, and delicious! 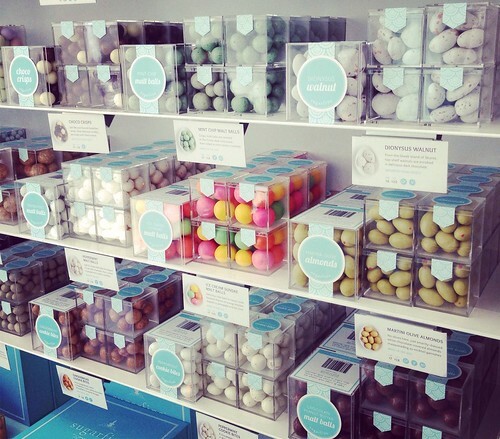 From there, we walked down Little Santa Monica to Sugarfina, which I had driven past a gazillion times but never been in. The store is gorgeous–clean lines, simple colors, and their displays and packaging are beautiful. We were given a few candy options to sample–I went with the Champagne Bubbles and the Robin’s Egg Caramel. The champagne bubbles have tiny nonpareils on the outside, giving it some crunch, and the champagne flavor came through nicely. 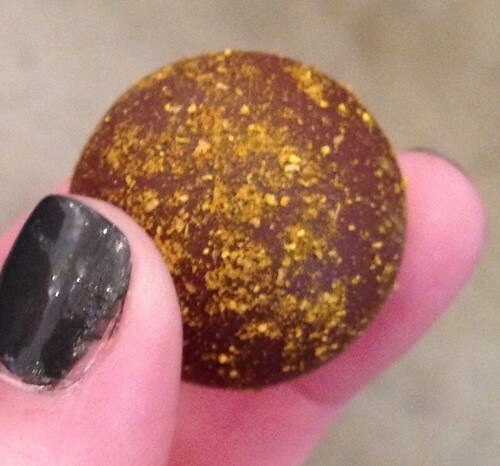 The robin’s egg was perfect–dark chocolate, amazing caramel, and a candy shell. 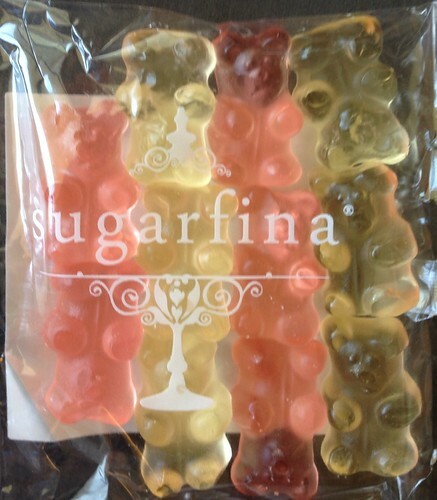 We were also treated to a small bag of our choice, and I selected the Champagne Bears because, well, champagne and gummi candy–how awesome is that? On the way to our next shop, we stopped at the Beverly Hills Visitor Center and I learned they have coupon books with great deals, including two for one Sprinkles cupcakes! So next time you’re in the area, swing by and snag one! They’re located right across the street from the Paley Center. 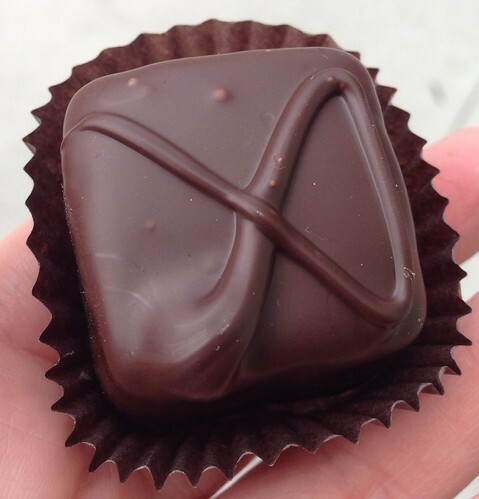 Next, we walked down to Beverly Drive to Edelweiss Chocolates. The woman working there was absolutely adorable, and even let us see their factory, which is mainly just supplies and marble slabs because they do everything by hand! While there, we tasted the dark chocolate covered marshmallow which was incredibly fluffy and fresh, and nothing like a store-bought one. 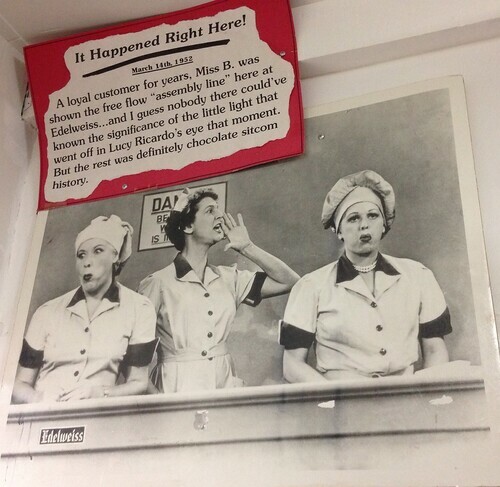 Fun fact: Edelweiss was the inspiration for the I Love Lucy chocolate factory episode. 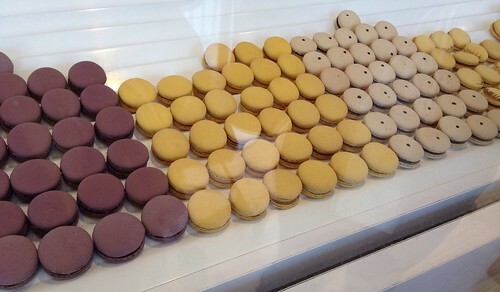 Stop number four was Lette Macarons, located on Charleville just east of Beverly Drive. It’s a place I’m all too familiar with because I used to get my eyebrows done across the street, and would treat myself to a salted caramel macaron each time I had an appointment. It’s an expensive but delicious addiction! Anyway, on the tour we sampled their Caribbean Chocolate macaron, which is filled with an incredibly rich and delicious chocolate ganache. Fun fact: Lette’s architect won the City of Beverly Hills Design Award for the concept and design. 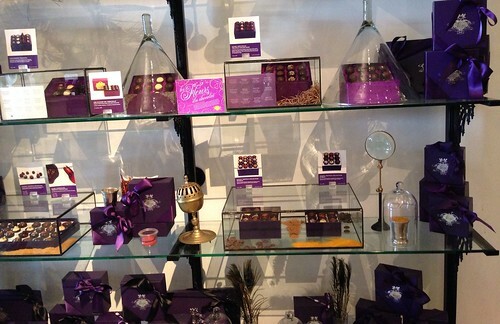 We then continued down Beverly to Vosges Haut-Chocolate where we tasted a Naga Truffle made from curry powder, coconut, and milk chocolate, a very unique combination! p.s. Ignore my horrible polish job in the following photo. We also learned the proper way to eat a truffle–rub the flat bottom with your thumb, turn it upside down, take a bite, feel the texture on your tongue, then eat the rest. Not sure I’ll always do that, but good to know when it’s time to bust out a fun fact at a dinner party. 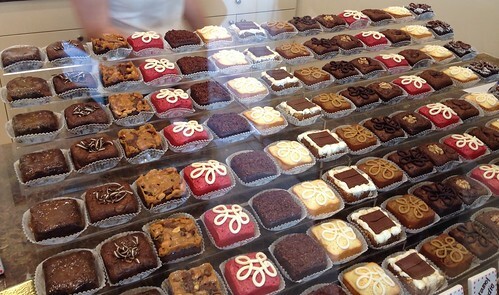 Taking a break from chocolates, we then visited Beverly Hills Brownie Company. 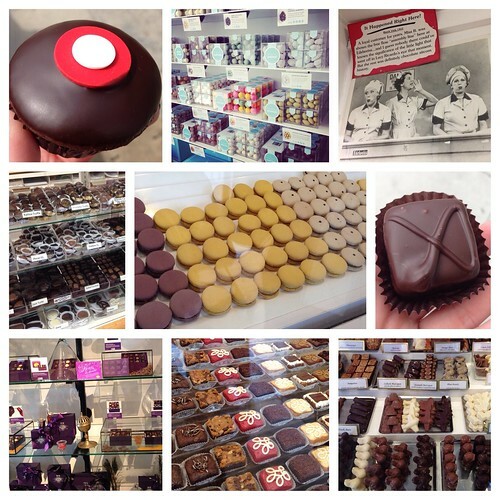 They have every flavor brownie imaginable, but since this was a chocolate tour, we sampled the Simply Classic flavor. Dense and fudgy, this will definitely help with any chocolate craving! 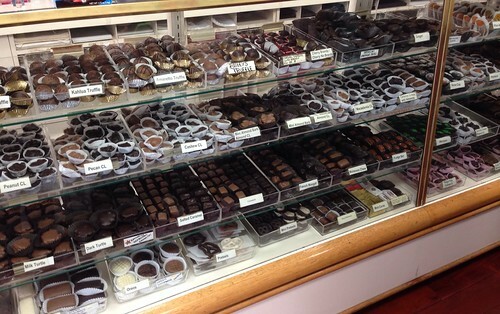 Our last stop on the tour was Teuscher Chocolates of Switzerland, located on Brighton Way. Apparently champagne was the flavor of the day, because we were treated to Champagne Truffles made with Dom Pérignon and covered in dark chocolate. Not only did I get to try delicious local treats, I got to explore Beverly Hills on foot, something I don’t do very often. It was obvious that everyone on the tour really enjoyed the experience, and I would do it again in a heartbeat! @Robin – You should do the tour if you have time–look for discounted tix on Amazon Local Deals. Enjoy your visit! Ohhh I so want to try a Champagne bear! @Peabody – They are ridiculously good! When you find yourself in LA, make sure you go there!